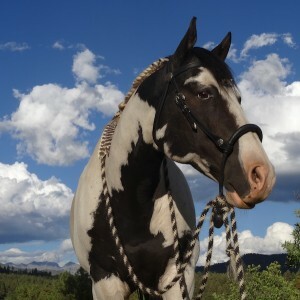 Did you know that Terri, (Owner of Out West Saddlery) is also an accomplished horse herbalist? Her equine herbs programs use Kinesiology to ask a horse what systems in its body are off balance, and need detoxification. Her work has helped horses and their owners immensely, sometimes in the face of a problem that had become chronically unsolvable by veterinarians. Click to visit Terri's Out West Herbs page to learn more about having your horse evaluated, the herbal blends that are used, and testimonials! "I have a sensitive horse named "Dream Came True" or, Bravo for short. He's a big, registered paint gelding that was given to me after he was let go by his breeder for not fitting in with their training program to become a reining horse. They told me: "He just acts like he hates the world". Apparently he would bolt, bite, and buck. Basically whatever it took to get off the lead rope, away from touch, or out from under the saddle, he would try. Today, Bravo and I ride on intense trails in the high country several days a week in the Spring Summer and Fall, and occasionally participate in clinics and other events. He has become an incredible, steady, happy horse that I can rely on in all situations, and trust to be there for me mentally, emotionally, and physically in ways that I never would have dreamed possible when I first met him. He was someone else's give-away, but is now my "Dream Came True", thanks to Terri and Bob's amazing help."